Here is a mental fun game to kill some time in off season. 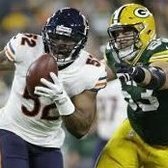 If you could magically take 5 players from any team and replace 5 starting players on Bears at same position of player you take who would the 5 players be? Ignore the cap if you want. Factor the cap if you really want to stretch your brain. 2) Tyreek Hill - Gabriel . You might say why not Aaron Donald? Because our D line is already very good and I was factoring in contracts even though I wasn't strict with it and didn't crunch numbers. I went with 5 guys on rookie deals who could really upgrade our team at those positions even if guy they are replacing is good. I replaced 5 good players with special players. Long at his best was special, but not as special as Nelson and Long in his current state is broken. Maybe the game should be replace 5 of our guys with 5 guys on rookie deals? Travis Kelce, Stephon Gilmore, George Kittle, Ryan Ramcyzk, Chris Jones, Darius Leonard, whoever best kicker is. Muzzle is cheating. Had to be a starter. I like Garret for Floyd. Well... damn. I see I completely missed that. Fine. Replace Mizzell with Howard, then cut Mizzell.